West End was very active in the early 1900s, right up to the great Hurricane of 1915 (hurricanes weren’t named at that time). The last piece of Pontchartrain Boulevard, the road on the western side of the New Basin Canal, was a toll road, the toll receipts used for road upkeep. The West End Streetcar line traveled on the east side of the canal, parallel to West End Boulevard (just out of the frame here, on the right). I did not get a chance to send the thread sooner, but I did not get a chance to go out. Mama is very bad off. There will be another consultation today. Ed (? )/Eda (?) is here, & Ernest is leaving Sunday. Lariern left Wed and came to see us Tuesday. Love to all. (illegible) soon, Bertice. The postcard is typical of the period, a black-and-white photo that is then hand-colored and printed. It’s interesting that Bertice wrote her message on the bottom of the front. Perhaps she was afraid that the recipient would admire the photo and not read anything on the back? The choice of scenes for this card is also interesting. She’s conveying what appears to be bad news about “mama”, yet the postcard is of a part of town usually associated with happy experiences. West End was a big day-trip destination at the time. Of course, I’m probably reading too much into this. It’s more likely that Miss Bertice grabbed an inexpensive card at the drugstore to send a quick note, not giving much thought to the image on it. I hope mama’s consultation went OK! Image courtesy of the Louisiana Research Collection (LaRC) at Tulane. If you’re on Facebook, you want to follow their page. They post some cool stuff, and it’s fun to look at the stories behind what they share. Be sure to check out the latest episode of NOLA History Guy Podcast, which presents the history of West End as a day-trip destination for New Orleanians looking to escape from the heat and humidity of city life. Podcast #3 – Day trips out to West End and Spanish Fort, by train or streetcar. Beating the summer heat is an ongoing challenge in New Orleans! Hot summers in New Orleans are certainly not a new phenomenon. Staying cool in the Summer months has been a challenge since the French and Spanish explorers came Louisiana and the Gulf Coast. These days, we run from our air-conditioned homes to our air-conditioned cars to our air-conditioned offices, then back again in the evening. Now, think about doing that at a time when there was no air-conditioning! Every work day, riding the streetcar or a bus to the office, and home again. Older homes were designed to maximize air flow, and electrification provided power for fans in any rooms in the house. Still, it got hot. You know how that goes, when the a/c is broken and you have to rely on ceiling fans! The men who went off to work had to deal with the same heat and humidity as the women, but they were on the move more. Mom was stuck at home with the kids. Day in, day out, doing the housework, cooking the meals, supervising the kids, Mom needed an escape! The easiest escape route for mom and the kids, sometimes even dad, if he could take a day off, was on the streetcar, heading out to the Lakefront. There were two popular escape destinations, West End and Spanish Fort. 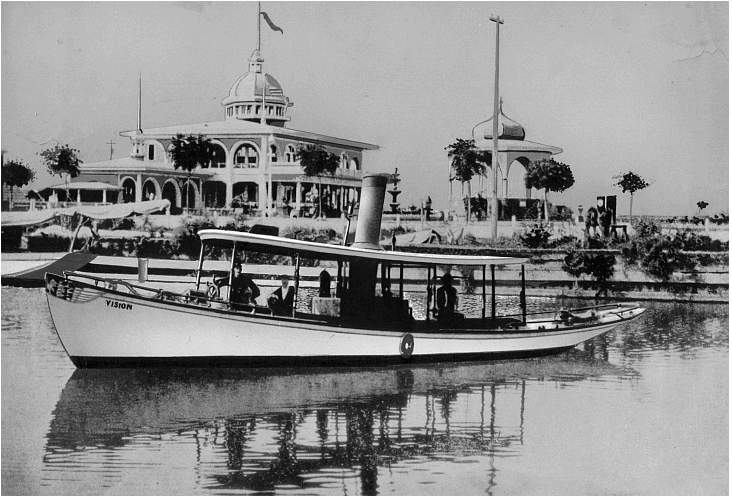 We’ll talk about the attractions at both, and how folks got out to Lake Pontchartrain. The craziest day at West End was always Good Friday! After the solemn aspects of Good Friday were observed, many New Orleans families headed out to West End for seafood. Strictly speaking, it wasn’t exactly as solemn as perhaps the Church wanted, but the food was good. Two of the popular restaurants were Brunings (top) and Fitzgerald’s. Both of these photos are from 1995. My family always preferred Brunings; their whole stuffed flounder is still the standard by which that dish is judged. 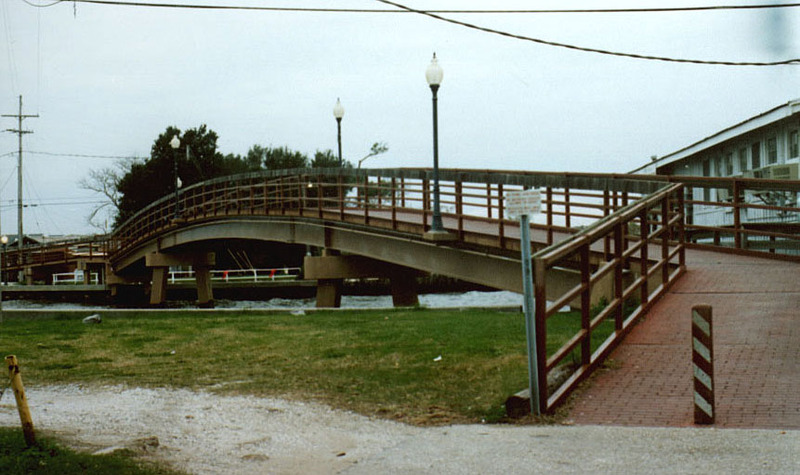 We would come from the Metairie side of West End, crossing the old Bucktown Bridge, which, alas, ATNM, between storms and the enhanced flood protection/controls on the 17th Street Canal. 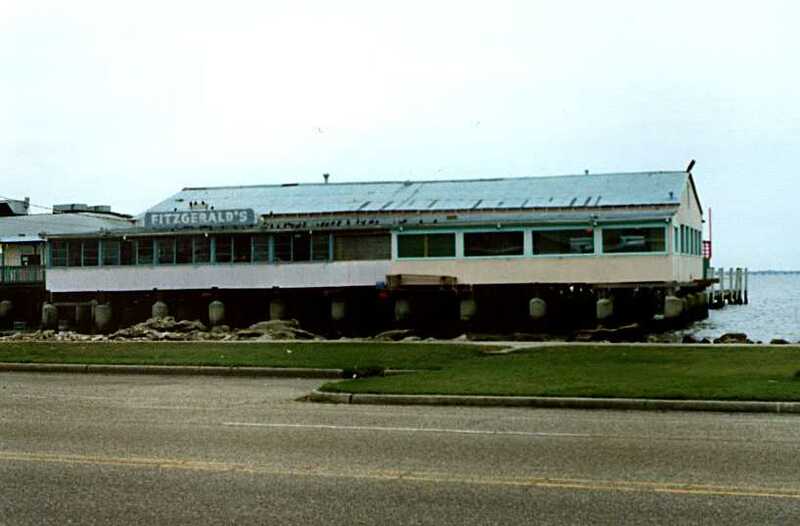 Hurricanes during the 1990s all but obliterated the restaurants, bars, and nightclubs at West End. Even before Katrina, it was impossible for the property owners to re-build, because of wind and flood issues. No insurance company would underwrite reconstruction or new development. 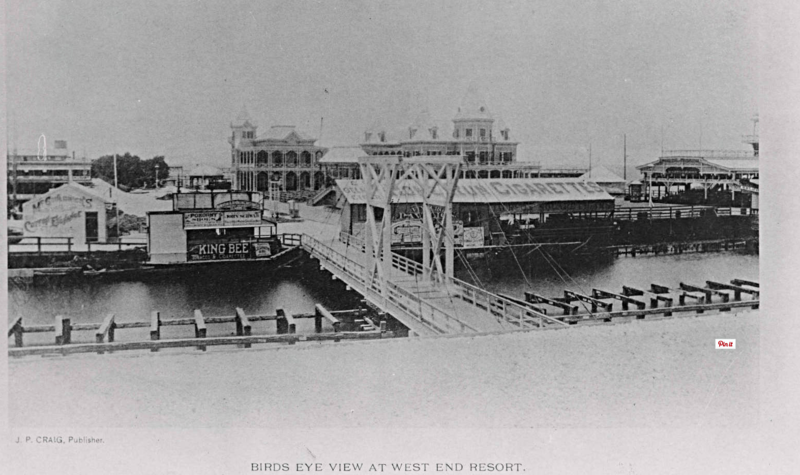 West End for dining and entertainment is a thing of the past, but many folks still have fond memories of fun evenings looking out on the water. Fridays in Lent usually bring out all the memories of going to Bruning’s, Fitzgerald’s, and other seafood places out at West End. Here’s a photo from an earlier vintage of West End, 1892. The restaurant on the left is Mannessier’s, on the right, West End Restaurant. Mannessier’s Restaurant was owned/operated by the same family that owned Mannessier’s Confectionary at 705 Royal Street, in the French Quarter. They opened the West End location in the late 1880s. They added a pavilion to the property in 1899, which was taken down in 1911. At this time, West End was more of a day trip from downtown/uptown. You made your way to Canal Street and took the West End streetcar line out to the lakefront.